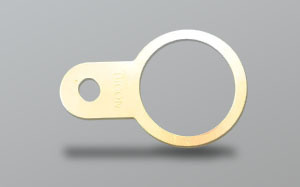 Kingpin are a leading manufacturer of brass locknuts for the cable gland industry. With so many shapes and sizes of cable gland in use within the sector, we know that finding the right brass locknut is essential. We endeavour to deliver that perfect locknut directly to you. Brass is a great material to use in cable glands. Our brass locknuts are lightweight, but durable. This, coupled with their lightning quick turnaround time, has seen our brass locknuts put to use in innumerable cable glands, and other electrical components too. We supply various sectors with high quality brass locknuts, because our elite standards transcend out specialist industry. So if you want reliable, strong brass locknuts for any electrical equipment, Kingpin is the only manufacturer you’ll ever need. 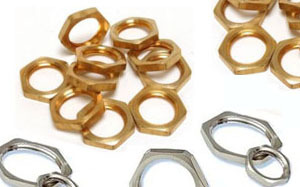 Manufacturing all of our brass locknuts in-house, we can assure all customers of their quality. We know how vital the locknut component is within a cable gland, so we never compromise on its quality. Simply put, shoddy products do not leave Kingpin – every single product that goes out of our doors is fit for purpose in every conceivable way. So whatever size you need, and however quickly you need it, we are here to help. You’ll also be dealing directly with us throughout the process, so whatever you order from Kingpin will be made precisely how you want it. Call 0121 559 7742 or contact us for enquiries on locknuts and more information. With the sheer amount of electricity surging through cable glands, having an earth connection is vital. That is what earth tags provide. If you had been looking for a different material for your locknut, chances are Kingpin stock it. Click above to see the full range. 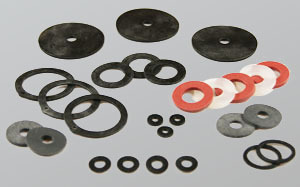 Helping to keep foreign bodies on the outside of the gland, washers are just as vital as earth tags and locknuts. Kingpin manufacture them in a wide selection of sizes and materials.